Before the arrival of the automobile, Amsterdam’s street scene was largely set by the horse-and-cart, barrows and coaches. 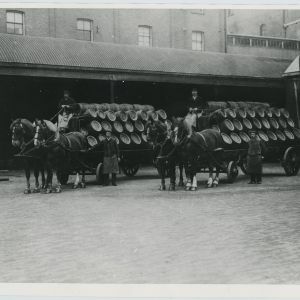 Casks of beer were also delivered to the various cafés by the horse-drawn beer wagon, the brewers’ dray. 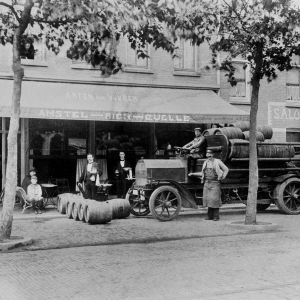 Around 1900 the Heineken brewery bought the first motorized lorry and in 1907 Chris van Eijk, head of Dispatch, posed in the Amstel brewery’s first automobile, a 22 PK Daimler, in front of the café ‘Anton van Vuuren’ on the Ceintuurbaan in Amsterdam. In 1974 Ger Dorant, the former owner and art director of Pätz Advertising Bureau, was given the task of designing a new beer wagon for Heineken. This had to be clearly distinct from the Amstel ‘spanwagen’ (paired horse dray) and as ‘authentic’ as possible. The dray built after his design was 6 metres long, with a canopies seat for the coachmen and drawn by a team of four horses. It is an authentic piece of handicraft. 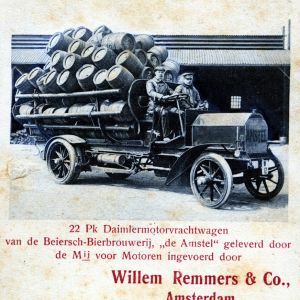 Wainwright (wagon-maker) Jan van Peet from Meerkerk made the entire body-work by hand and the 82 year-old cooper from the Heineken brewery in Rotterdam, Mr A. van der Heijden, provided the dozens of beer-barrels carried by the dray. 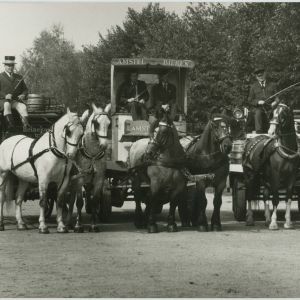 On the 10th of May 1977 the dray was handed over by the burgomaster of Meerkerk to Mr Veenhof, head of Heineken’s Publicity Department. Eight days later the dray made its first journey round Amsterdam. This flagship of the publicity caravan symbolically delivered a cask of beer to the café Heineken Hoek, after which passers-by were offered a glass of beer. 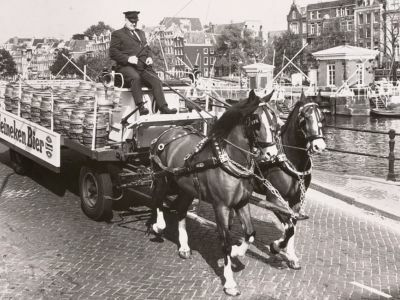 The dray remains in use to this day, drawn by four of Heineken’s great shire horses, and can still be seen regularly on its journeys along the Amsterdam canals. But it was not until the twenties that the internal combustion engine gradually replaced horse-power. 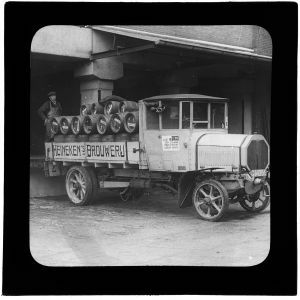 In those years the Amstel brewery also used electric-powered lorries to transport beer in Amsterdam. Because they made no noise they were known by Amsterdammers as the ‘sluipmoordenaars’ – assassins. Horse-drawn drays were still in regular use for transport up to the Second World War, specifically in the inner city where, because of the short distances involved and the necessity for frequent stops, they could still compete with motorized transport. 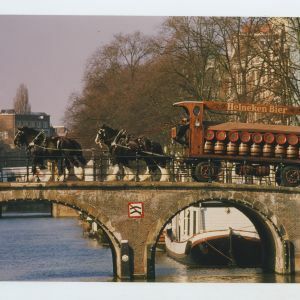 Right up to the seventies in Amsterdam’s inner city beer barrels were delivered by horse-drawn drays. 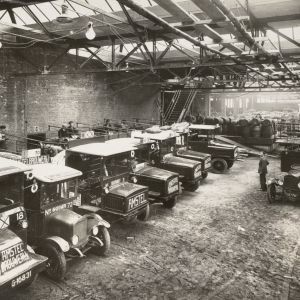 Shortly after the Second World War, in 1947, it was decided to get rid of the eight horses still in active service in the Heineken brewery in Rotterdam, as there were enough lorries available. 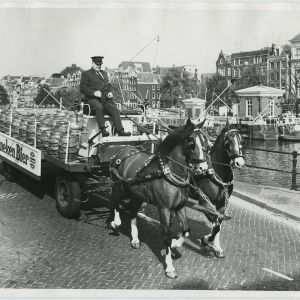 But in Amsterdam, the same year, it was decided otherwise: the Board of Directors there were almost unanimously of the opinion that while ‘horse-drawn transport is expensive, it is entirely sensible to maintain this traditional advertisement’. 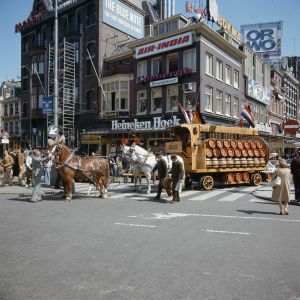 When a few decades later Heineken took over the Amstel brewery, in addition to the Heineken drays the Amstel dray, with the characteristic high canopy above the box, was also retained in use for advertising purposes.